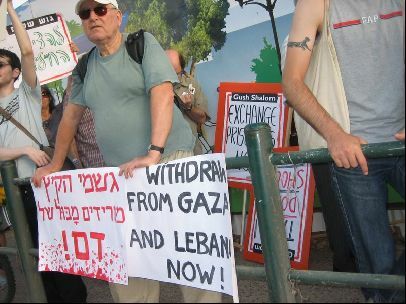 As the world becomes increasingly concerned with the response of the Israelis to events in Lebanon as well as Palestine, and terms such as "over-kill" and "disproportionate" are used to describe the actions of Israel, protests in Israel are also taking place. Below is a description and call to attend a protest in Perth, WA. Please attend! 16 October 2006: Reporting on the Loewenstein Book Launch and Forum - a page with photos, speeches and articles following the 11 October 2006 Forum on Antony Loewenstein's My Israel Question at Kulcha Multicultural Arts of WA, organised by Project SafeCom, in collaboration with the Social Justice Network. 11 October 2006: Antony's Israel Question: Book Launch and Forum This is the official Western Australian Book Launch and Forum for Antony Loewenstein's 'My Israel Question', a forum with Antony Loewenstein, Prof Linda Briskman, Dr Samina Yasmeen and Giz Watson MLC at Kulcha, Fremantle. Organised by Project SafeCom in collaboration with The Social Justice Network. 20 July 2006: John Mearsheimer and Stephen Walt: The Israel Lobby - Yesterday, ABC Lateline reported: "... two leading American academics have sparked a war of words over their claim that US-Middle East policy has become unbalanced because of the activities of a right-wing pro-Israeli lobby, which tries to shut down critics by labelling them anti-Semitic." Here is the "offending" article, from The London Review of Books. 10 February 2006: Worlds apart: Israel, Palestine and Apartheid - After four years reporting from Jerusalem and more than a decade from Johannesburg before that, the Guardian's award-winning Middle East correspondent Chris McGreal is exceptionally well placed to assess an explosive comparison. The first part of his two-part special report. What is happening in Lebanon? NOTE: The flyer for the rally can be downloaded from here. From July 12 to July 24, over 400 people were killed by the Israeli army and airforce in Lebanon - the vast majority of them civilians. More are missing and wounded. Half a million Lebanese have been driven from their homes, 100,000 have fled to seek refuge in Syria. hospital officials in Tyre, Lebanon, declared on July 20 that mass graves have been prepared to bury the victims. In the same period, Hezbollah have killed 36 Israelis, 25 of them soldiers. Israel's government say they are attacking Hezbollah, but have bombed civilian areas and infrastructure in the north of Lebanon, while Hezbollah are based in the south. Power stations, freeways, residential suburbs, bridges, ports and Beirut airport have been bombed. The Israeli army have also killed over 100 people in Gaza in the same period in what they say is an attempt to free another Israeli POW. With medical goods and clean water in short supply, an ever-growing number of homes destroyed and people killed or wounded, Lebanon is in the grip of a humanitarian catastrophe. Israel invaded Lebanon in 1982 and withdrew their army in 2000. Tens of thousands of Lebanese and withdrew their army in 2000. Tens of thousands of Lebanese were killed during this occupation. During this period, Hezbollah enjoyed huge growth in support and membership. The Israeli army is currently massing land forces on the border with Lebanon. The US and Australian government support Israel's current bombing campaign. With every civilian killed in Lebanon, Hezbollah grows in power and influence. The long-term well-being of the Israeli people is being undermined by the actions of their government. While Israel continues to occupy the West Bank and attack Lebanon and Gaza, there can never be peace in the origin. We call for an immediate ceasefire in Lebanon and Gaza, and for the US and Australian governments to cease their support of the current bombing campaign. VIOLENT scuffles have broken out between police and Lebanese protesters who mobbed Prime Minister John Howard's car as he left the WA Liberal Party conference in Perth. Mr Howard was leaving the WA Liberal Party state conference when about 200 protesters, many of whom were waving Lebanese flags and shouting "we want peace", mobbed his vehicle. Protesters punched, kicked and threw projectiles at Mr Howard's car as police struggled to keep them at bay. Mr Howard's entourage sped from the scene as police wrestled protesters to the ground. The Prime Minister said this week he understood Israel's decision to carry out its devastating military offensive against Lebanon to put an end to attacks by Hizbollah guerrillas who have fired rockets deep into Israeli territory. At least one protester was arrested and taken away by police. Protesters later continued their rally along one of Perth's main streets calling for peace in the middle east. Protest leader Muhammad El Khatib said he has family in Lebanon and the Australian government is not doing enough to broker peace in the region. "There are mothers watching their children die," Mr El Khatib said. "There should be aid, they say there is aid getting through to Lebanon, there isn't," he said. "There are people hiding from bombs, we just want peace." "Hizbollah is protecting Lebanon, they are freedom fighters, not terrorists," he said. People in cars with Lebanese and Palestinian flags attached circled the protesters and police, honking their horns in support. Earlier a separate peaceful anti-war rally in the city attracted bout 500 people. When 24-year-old Diana Aoun fled the Israeli occupation of Lebanon in the 80s, she hoped her immediate family had finally escaped the violence. They had. But at a 500-strong rally in Perth to condemn Israel's recent action, Ms Aoun also told of how she left her extended family in southern Lebanon. Now, some of their friends are dead - killed by Israeli bombs. Apart from her parents, brother and an uncle here in Perth, the rest of Ms Aoun's family are refugees, fighting for their lives. "I had family living in small villages in southern Lebanon," Ms Aoun said at the protest, outside Wesley Church in Hay Street. "They've both been bombed. We know of people who have been killed, bombed in their own buildings. "Our own family has had to leave their villages and have become refugees in their own country. "Children are being burned with phospherous bombs - hundreds of children burned, elderly being killed. While the rally was peaceful, Ms Aoun and other Lebanese-Australian protestors were clearly distressed. "Other Australians, I urge you to seek the truth," Ms Aoun said. "I urge you to see with your eyes, open your heart, see the inhumanity that is happening. "Why doesn't the international community stand up against this murder? How can John Howard stand up and justify this?" Just Peace organiser Chris Latham said there were concerns about Israel's escalation of the conflict. "If this spirals out of control and other states join the conflict, that is a real danger," he said. AUSTRALIANS are becoming more and more concerned about the conflict in the Middle East, causing the scuffles between protesters and police in Perth yesterday, a peace forum organiser said today. Yesterday's scuffles came as around 200 protesters, who had been marching for peace through the streets of Perth, converged on a hotel, where Prime Minister John Howard was delivering a keynote address to a Liberal Party conference. Melita Kidd from the No War Alliance said the scuffles were not planned and were an example of the level of concern the Australian public had at the growing conflict in the Middle East. The scuffles resulted in an Australian flag on the Prime Minister's car being bent out of shape and the arrest of two protesters on minor charges. Both protesters have been released on bail and will appear in court next week. One has been charged with assault on a police officer and another with obstructing a police officer. The skirmish happened as Mr Howard left the conference meeting at the Hyatt Hotel. Mr Howard had used his speech to the conference to attack Hezbollah, which is fighting Israel in southern Lebanon. "It's not some kind of inspirational liberation organisation, it's a terrorist organisation," he said. As the Prime Minister departed, the protesters surged towards his car, demanding an end to the war which has killed hundreds of civilians. The protesters, many waving Lebanese and Palestinian flags, clashed violently with police as Mr Howard made his exit. Ms Kidd, who was at the rally said it was ironic that the motives of a protester who damaged a decorative flag on the prime minister's car were questioned by the media while the actions of those that supported Israel in its bombing of Lebanon remained unchallenged. "The actions of the protesters have been termed violent but the protesters were just acting out their frustration at what is going on in Lebanon," Ms Kidd said. "We were expressing an opinion that we don't want any war." Another peace forum today is designed to educate the public about the conflict in the Middle East and help build a substantial anti-war movement in WA, Ms Kidd said. Former WA Premier, Fremantle MP Carmen Lawrence will address the forum in the Fremantle Town Hall.